You can't turn your back on a leftist douchebag for five freaking minutes before they decide to pull something else. The other day, I said this entire mishegas with CaonCarolinas and John Ringo was over. I even sent them a letter of congratulations. I even started making plans to talk Superversive and Silver Empire publishers into joining me in their dealers room. And then I see this from David Weber. THE CONVENTION ISN'T EVEN OVER A WEEK and the lefty lynch mob is trying to get the two sane members of the Con Committee, Jada and Luis, kicked off. They've even started a petition to get 600 signatures to remove them. post on the Carolinas Facebook page that we have done so — one by one — and why, and inform them that if, in fact Jada and Luis are evicted from the concom, they may have our money this year, but they will never get it again. We are not telling them that they cannot invite whoever they want to invite. We're telling them that once an invitation has been issued, they have no business revoking it just because of online hysteria, whether it comes from the left or the right. If the people fighting to remove Jada and Luis from the concom simply cannot or will not understand that, and they win, then this convention in my opinion will deserve to die because it will have voluntarily cut itself off from the 50% (minimum) of fandom which does not approve of banning anyone. This is their decision. We can weigh in, we can hope to sway them in the direction of open-mindedness, civility, and sanity. We can't MAKE them go there, but if they decline, then we don't have to go wherever the hell it is they think they're going. We're here to support Jada Hope and Luis Diza's stance on the demands to disinvite guests at ConCarolinas based on unfounded and unproven stories posted by Internet pressure groups. Our goal is to obtain as many signatures as possible as a way of demonstrating who is truly in favor of diversity by raising our voices. We'd like to count them in the hundreds, but we'd really rather count them by the thousand. This is not a petition to support inviting guests who the con committee believes would be problems for the con or who do not seem, to the con committee, to be a "good fit" for the people who attend ConCarolinas. We who sign this petition are saying only that once an invitation has been issued, the guest invited should not be subsequently disinvited simply because someone else planning to attend the con will be uncomfortable in that guest's presence. Some of us have attended ConCarolinas in the past, as either a ticket-buying attendee of the con or as an invited guest. Under the ‘I’m signing because...” section please indicated if you’ve attended in the past as a guest or attendee and if you will attend in the future if they are removed. The video below shows the apology that Jada Hope made at the end of ConCarolinas 2018 on June 3rd to John Ringo and re-emphasized the con's commitment to an inclusive atmosphere for all people. See, ConCarolinas? This is what happens when you give in once, even just a little, to the lefty mob. They owned you once, even for a little while, therefore they're certain they can own you again. They won't go away until they are routed or until they win. They'll wear you down, howl for your blood because they have nothing better to do with their endless hate, and you endure them until they go away in search of other prey. They took one look at what they saw as your capitulation over Ringo, "knew" they could do it to Correia, and moved onto Origins. I expect they're going to shoot for DragonCon next, just because. But hell, look at how low these leftists set this bar: 600 signatures. That's it? They think that's all it will take? I have more members in my author Facebook group. I really hope that DragonCon is looking at this infiltration and going "oh Hell no." Because this is what some bozos are going to try to do to them -- maybe not today, maybe not tomorrow, but soon. I am sick and tired of all of these muthaf****in lefties trying these dumbass muthaf****in tactics to screw up my muthaf****in conventions. Literally tired. I was going to go to bed, tuned into Facebook and discovered THIS BS. On the bright side, a side by side comparison at the moment between the two petitions ... is no comparison. The numbers by the fake lynch mob are laughable next to the steamroller that is Weber's petition. I think there are some people at Con Carolinas is going to look at the "remove Luis and Jada" petition and face palm, wondering "Why did we ever believe these a-holes were a threat? There are so few of them." I mean, the only way that the lefties can get their petition through is if they borrow all of the Chinese bots from File 770. And right now, I wouldn't put them up against Weber's army. When Weber says "fire for effect," he means it. Anyway, if you want to drop comments on the idiots and make fun of them for trying this in the first place, click here. If you want to join the wave of people at Weber's petition in support of sanity, click here. 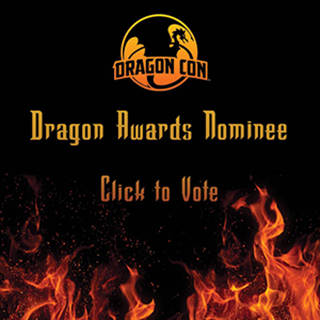 And if you've done that and you have the time, the Dragons are coming, go nominate stuff over there. If you don't have your ballot filled out already (either IRL or in your head,) here's my list. It includes the lists of other people, so there are options. Just remember to vote. Something to relax to. Because they have no politics. Now pardon me, I'm going to bed. Haven't you been following Charlotte Moore? Evidently she tried pushing an SJW agenda at DragonCon. She's no longer the Fantasy Lit track director. DragonCon isn't bowing to the SJWs. I know the DC isn't bowing to the SJWs. But I don't count Charlotte as a full-scale attack on DragonCon. Mild infiltration, perhaps. Give it a few months before they try REALLY going after DragonCon. I expect the push back will be epic. I just want DragonCon to take notice and be on the lookout. They have lowered the bar even further. Now they only want 500 signers. They currently have 118. David Weber's counter petition has 1,968. Get woke, go broke indeed.